This article is about a type of poem or writing. For the word puzzle, see Acrostic (puzzle). An acrostic is a poem (or other form of writing) in which the first letter (or syllable, or word) of each line (or paragraph, or other recurring feature in the text) spells out a word, message or the alphabet. The word comes from the French acrostiche from post-classical Latin acrostichis, from Koine Greek ἀκροστιχίς, from Ancient Greek ἄκρος "highest, topmost" and στίχος "verse". As a form of constrained writing, an acrostic can be used as a mnemonic device to aid memory retrieval. Relatively simple acrostics may merely spell out the letters of the alphabet in order; such an acrostic may be called an 'alphabetical acrostic' or Abecedarius. These acrostics occur in the first four of the five chapters that make up the Book of Lamentations, in the praise of the good wife in Proverbs 31, 10-31, and in Psalms 25, 34, 37, 111, 112, 119 and 145 of the Hebrew Bible. 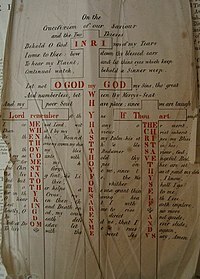 Notable among the acrostic Psalms is the long Psalm 119, which typically is printed in subsections named after the 22 letters of the Hebrew alphabet, each section consisting of 8 verses, each of which begins with the same letter of the alphabet and the entire psalm consisting of 22 x 8 = 176 verses; and Psalm 145, which is recited three times a day in the Jewish services. Some acrostic psalms are technically imperfect. E.g. Psalm 9 and Psalm 10 appear to constitute a single acrostic psalm together, but the length assigned to each letter is unequal and five of the 22 letters of the Hebrew alphabet are not represented and the sequence of two letters is reversed. In Psalm 25 one Hebrew letter is not represented, the following letter (Resh) repeated. In Psalm 34 the current final verse, 23, does fit verse 22 in content, but adds an additional line to the poem. In Psalms 37 and 111 the numbering of verses and the division into lines are interfering with each other; as a result in Psalm 37, for the letters Daleth and Kaph there is only one verse, and the letter Ayin is not represented. Psalm 111 and 112 have 22 lines, but 10 verses. Psalm 145 does not represent the letter Nun, having 21 one verses, but one Qumran manuscript of this Psalm does have that missing line, which agrees with the Septuagint. Acrostics are common in medieval literature, where they usually serve to highlight the name of the poet or his patron, or to make a prayer to a saint. They are most frequent in verse works but can also appear in prose. The Middle High German poet Rudolf von Ems for example opens all his great works with an acrostic of his name, and his world chronicle marks the beginning of each age with an acrostic of the key figure (Moses, David, etc.). In chronicles, acrostics are common in German and English but rare in other languages. Often the ease of detectability of an acrostic can depend on the intention of its creator. 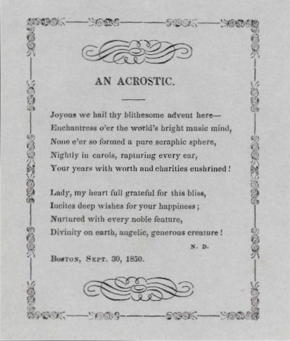 In some cases an author may desire an acrostic to have a better chance of being perceived by an observant reader, such as the acrostic contained in the Hypnerotomachia Poliphili (where the key capital letters are decorated with ornate embellishments). However, acrostics may also be used as a form of steganography, where the author seeks to conceal the message rather than proclaim it. This might be achieved by making the key letters uniform in appearance with the surrounding text, or by aligning the words in such a way that the relationship between the key letters is less obvious. This is referred to as null ciphers in steganography, using the first letter of each word to form a hidden message in an otherwise innocuous text. Using letters to hide a message, as in acrostic ciphers, was popular during the Renaissance, and could employ various methods of enciphering, such as selecting other letters than initials based on a repeating pattern (equidistant letter sequences), or even concealing the message by starting at the end of the text and working backwards. There is an acrostic secreted in the Dutch national anthem Het Wilhelmus (The William): the first letters of its fifteen stanzas spell WILLEM VAN NASSOV. This was one of the hereditary titles of William of Orange (William the Silent), who introduces himself in the poem to the Dutch people. This title also returned in the 2010 speech from the throne, during the Dutch State Opening of Parliament, whose first 15 lines also formed WILLEM VAN NASSOV. Vladimir Nabokov's short story "The Vane Sisters" is famous for its acrostic final paragraph, which contains a message from beyond the grave. So the great dogs of evil bay the world. Until King Saturn comes to rule again! You searchers of the earth be reconciled! Sweetly as ever tunes her Daulian strain. And over Tenedos the flagship burns. Rear like blue dolphins their cerulean curves? Summon the Orphic bard to stranger dreams. And so for us who raise Athene's torch. Sons of Columbia, awake, arise! In January 2010, Jonathan I. Schwartz, the CEO of Sun Microsystems, sent an email to Sun employees on the completion of the acquisition of Sun by Oracle Corporation. The initial letters of the first seven paragraphs spelled "Beat IBM". James May, presenter on the BBC program Top Gear, was fired from the publication Autocar for spelling out a message using the large red initial at the beginning of each review in the publication's Road Test Yearbook Issue for 1992. Properly punctuated, the message reads: "So you think it's really good? Yeah, you should try making the bloody thing up. It's a real pain in the arse." In the 2012 third novel of his Caged Flower series, author Cullman Wallace used acrostics as a plot device. The parents of a protagonist send e-mails where the first letters of the lines reveal their situation in a concealed message. In 2013 a school headmaster resigned after announcing the retirement of a teacher in a statement which began "We all now know every really great teacher has to finish one day..." The initial letters of the first six words caused offence. On August 19, 2017, the members of President Donald Trump's Committee on Arts and Humanities resigned in protest over the President's response to the Unite the Right rally incident in Charlottesville, Virginia. The members' letter of resignation contained the acrostic "RESIST" formed from the first letter of each paragraph. On August 23, 2017, University of California-Berkeley energy professor Daniel Kammen resigned from his position as a State Department science envoy with a resignation letter in which the word "IMPEACH" was spelled out by the first letters of each paragraph. In the video game Zork the first letters of sentences in a prayer spelled "Odysseus" which was a possible solution to a cyclops encounter in another room. The first letters make up the acrostich and the last letters the telestich; in this case they are identical. left: Luke 23:42: "Lord, remember me when thou comest into thy kingdom." middle: Matthew 27:46: "O God, my God, why hast thou forsaken me?" right: Luke 23:39: "If thou art the Christ, save thyself and us." The "INRI" at the top of the middle cross stands for Iēsus Nazarēnus, Rēx Iūdaeōrum, Latin for "Jesus of Nazareth, King of the Jews" (John 19:3). The three quotes represent the three figures crucified on Golgotha, as recorded in the gospels of Matthew and Luke. [Thou] Lord, remember'st thyne, if Thou art sought. His thorns my crown; my death be blest in his. Quit my accounts, withhold thy vengeful rod! And but to thee, O whither shall I go? For in thy cross my saving health I see. Lest Sin and Death sink me to rise no more. To live with thee sweet Jesus say, Amen. [Thou] Lord, remember st           th Y ne,            If Thou art   sought. His TH orns my crown; my dea T h       be     ble ST in his. Quit my ac CO unts,            with H old            thy VE ngeful rod! And but TO thee,                 O whither            S hall I go? For in th Y cross               my S aving          hea L th I see. Lest S IN and        Death  sin K me    to      rise + no more. To live +  with              the E sweet          Jes US say, Amen. ^ "Acrostic Poetry". OutstandingWriting.com. Retrieved 2011-04-30. ^ Oxford English Dictionary, 3rd ed., s.v. acrostic; "The expected spelling of the English word, on the n., monostich n."
^ "Acrostic Psalms". Biblicalhebrew.com. Archived from the original on 17 September 2008. Retrieved 2008-09-09. ^ Graeme Dunphy (2010). "Acrostics". In Graeme Dunphy (ed.). Encyclopedia of the Medieval Chronicle. Leiden: Brill. pp. 8–10. ISBN 90 04 18464 3. ^ "Steganography". Garykessler.net. Archived from the original on 8 September 2008. Retrieved 2008-09-09. ^ "Cryptology". Archived from the original on 17 September 2008. Retrieved 2008-09-09. ^ "HetWilhelmus:Dutch National Anthem". Dordt.org. Archived from the original on 21 April 2009. Retrieved 2009-05-13. ^ "Edgar Allan Poe:An Acrostic". Eapoe.org. Retrieved 2009-05-13. ^ Paczkowski, John (2010-01-21). "Sun CEO: Go Oracle!". Wall Street Journal. Archived from the original on 25 January 2010. Retrieved 2010-01-22. ^ "Captain Slow takes the fast lane - TV & Radio - Entertainment". Melbourne: theage.com.au. 2008-06-19. Archived from the original on 30 January 2010. Retrieved 25 Jan 2010. ^ Wallace, Cullman (2012-04-28). "Caged Flower Series: Book Three". Amazon Digital Services LLC. Retrieved 2017-08-23. ^ Lawson, Helen (1 March 2013). "W*****! Headmaster's message announcing teacher's retirement hid coded insult which was spotted by his departing colleague". Daily Mail. London. Archived from the original on 11 July 2013. Retrieved 22 January 2017. ^ "Trump's arts council puts hidden "RESIST" message in resignation letter". Vice News. Retrieved 2017-08-19. ^ "US science envoy steps down, spells out "impeach" in resignation letter". Cable News Network. Retrieved 2017-08-23. ^ ""For 2/14:" | | Poetry Nation". www.poetrynation.com. Retrieved 2017-11-15. ^ "Exploring Zork, Part 3 The Digital Antiquarian". Jimmy Maher. Retrieved 2013-10-06. ^ a b "WilliamBrowne:Behold O God!". Presscom.co.uk. Retrieved 2009-05-15. ^ Legg, Sarah (April 2014). "a piece of antiquity: on the crucifixion of our saviour and the two thieves". Retrieved 24 May 2014. Described in "CubicalBeaver". 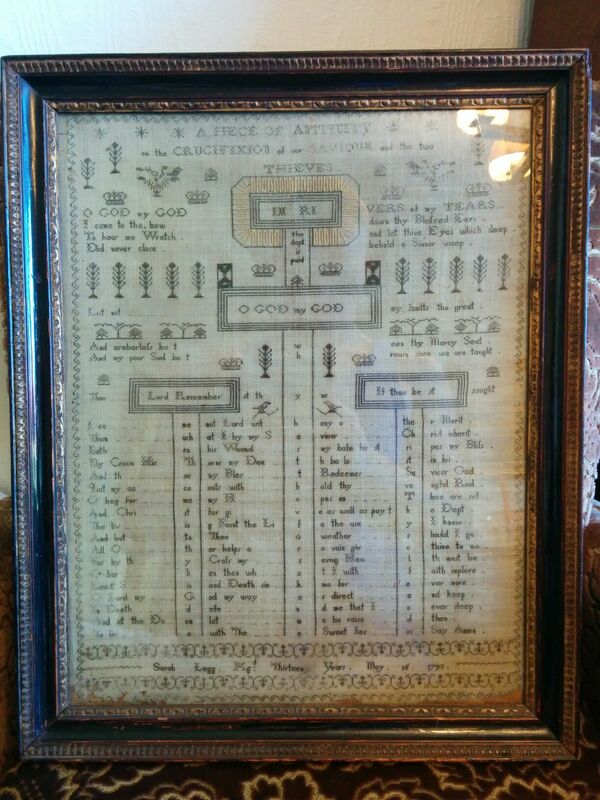 "Cross stitch tapestry from 1793 handed down in my family, titled 'a piece of antiquity: on the crucifixion of our saviour and the two thieves' by 13 year old Sarah Legg, England". reddit.com/r/history. Retrieved 24 May 2014. Wikimedia Commons has media related to Acrostics. Look up acrostic in Wiktionary, the free dictionary.